Simply perfect ECG's every time. Burdick set the standard for Interpretive ECG performance with the launch of its accalimed Atria line — and now allied with the prestigious Cardiac Science, continues to maintain its clear edge today. No other ECG on the market can boast the Atria's longevity and its proven, unmatched excellence of results, attainable through Burdick's extrordinary Glasgow Algorithm (GRI). The Atria 3100 ECG s our standard electrocardiogram system for private practices (see the Burdick Atria 6100 for additional features if you need something fancier than this!). 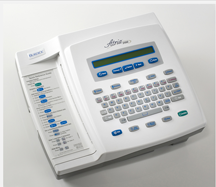 The Atria 3100 follows on the success of our earlier model, the Burdick Atria 3000, with the technology ensuring an accurate report with ECG protocol choices, helping eliminate transcription errors, and improving your workflow. Connectivity. Unlike its predecessor (the Atria 3000), the Atria 3100 comes with Ethernet connectivity as a standard feature. It's compatible with wireless 802.11 and Bluetooth, complies with FAA requirements, and has bi-directional communication with our HeartCentrix connectivity solution. Efficiency. The AccuPrint feature restricts ECG printing if lead wires are not properly attached, ensuring a clear printout and eliminating retakes. Flexibility. The unit manually or automatically produces high-quality 3-, 4-, 6- and 12-lead ECG printouts. No other ECG on the market can boast the accuracy and proven clinical results documented through the long history of Burdick's Glasgow Algorithm. Put simply, there is no point in collecting ECG's at your office or in your practice, unless they are going to be rigorously accurate, across a wide range of variables particular to each of your patients. Call us today and let us help you get started with your new ECG: You can reach us toll-free at 800-839-0722, or in Florida at 941-488-8808. We can easily help you set up your practice with an Atria 3100 or Atria 6100 ECG.